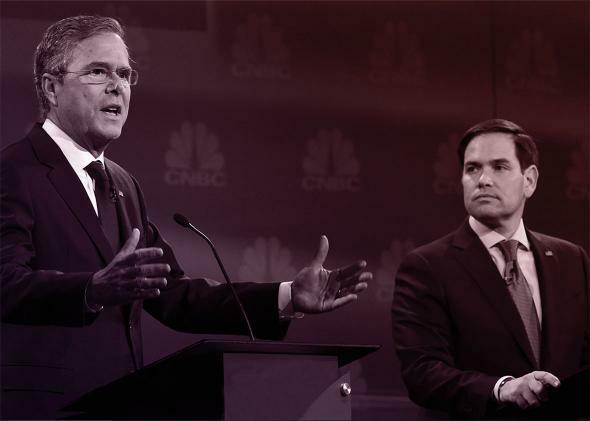 Jeb Bush, Marco Rubio go toe to toe in the third GOP debate. Jeb Bush swings at (and mostly misses) Marco Rubio in the third GOP debate. Jeb Bush speaks as Marco Rubio looks on during the GOP presidential debate on Oct. 28, 2015, at the University of Colorado in Boulder, Colorado. Podcast for America is your inside look at the fear, loathing, and self-delusion that is a presidential campaign cycle. Your hosts are Annie Lowrey of New York magazine; Mark Leibovich, national correspondent for New York Times Magazine; and Alex Wagner of MSNBC. Next, we weigh in on the perceived liberal bias in our nation’s media—a much griped-about issue from the debate stage Wednesday night. As members of the (some would say “liberal”) media ourselves, we have some opinions. And lastly, we discuss the other candidates on the GOP stage Wednesday night: notably Ben Carson, Carly Fiorina, Chris Christie, and Mike Huckabee. Is Ben Carson the new Teflon Don, and why did fantasy football enter the debate conversation?